Read Gail Staisil's journal from this trip. 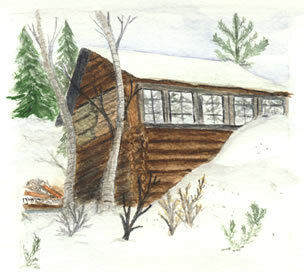 The 2005 Canadian Winter Expedition began, as most trips do for me, with the long drive north on I-75. As I left Flint the sky was overcast in a monotonous gray and the muted grays and browns of the midwinter landscape had a light sprinkling of fresh snow. The weather promised to be mild by comparison to previous years with predicted highs in the 20's and lows only in the single digits below zero. Not much changes along the interstate between trips and I decided to entertain myself by counting crows and hawks. Both increased in density as I went north and by West Branch there were several hawks per mile, resting in the trees, or gliding/hovering over more open areas. Three bald eagles also put in appearances, soaring majestically over the road. Beyond Gaylord the vistas became prettier--more hills, more snow cover on the ground and patches of blue sky and sunshine interspersed with the intermittent flurries. The windmills near Mackinaw City turned languidly, ivory towers serene against the pale gray sky. The ice below the Bridge looked cold and dark--a deep blue gray with patches of snow scoured thin by the steady winds. The UP passed quickly as darkness fell and the towers of the international Bridge at the Soo came into view surrounded by the twinkling lights of the Canadian side. Huge dark plumes of smoke from Algoma Steel were still visible against the fading light of the sunset. I pulled out my bridge fare and ID and proceeded across. After threading my way through the streets of the city, I headed north on Hwy 17. The road was clear and dry and the miles passed quickly. Despite the many signs warning of their presence, no moose ventured onto the road--for which I was very grateful. Soon the sign indicating Trail's End Road and The mad Moose Lodge appeared. I turned in to see if thee others had arrived. Trip leader Michael Neiger and two others, Gail Staisil and Cathy Susan, had made themselves comfortable in cabin number 7. A while later Dave Mansfield and Chris Ozminski found their way in. The evening's conversation wandered over what we'd all been up to since we'd last been together, including the rigors of a swamp crossing some of us had endured on an outing the previous weekend. We slept well despite the closeness of the quarters and awoke shortly after six to boil water and heat thermoses for a hot lunch on the trail. This activity completed, we repaired to the main lodge for a leisurely breakfast overlooking the scenic Montreal River. After breakfast and some last minute packing, we assembled for the drive to the trailhead. By noon we had spotted the vehicles, been shuttled to the starting point and were on our way into the wilderness. The weather was spectacular, clear and warm, the sky a flawless deep blue. Traveling conditions were excellent too, with a crust on the snow so firm that snowshoes were unnecessary. We proceeded up the portage trail to Gamitagama Lake, pausing to examine some large wolf tracks and later to chat with a couple of ice fishermen who were on their way back to the highway. We lunched in the bright sunshine near the shore of the lake, needing to don only a fraction of the usual insulation while we rested. After lunch it was warm too, and for several hours of the lake crossing I stripped to my sports top to keep from sweating. When we reached the east end of the lake, the wind picked up and we decided to proceed a ways down the Anjigami River to find a more sheltered area for camping. We found a suitable spot at the edge of a swamp and put up our assortment of shelters. Michael helped Cathy build a trench shelter in the 4-foot-plus-deep snowpack so she could see first hand the protection it provides. He chose to sleep under the stars himself though. It was a mellow evening, comfortable because of the mild temps (in the teens), and taken up with leisurely meals and conversation. Michael, who had broken a sled trace in the descent of a small slope, spent some time repairing it. Dark clouds that had passed over at sunset hung near the horizon leaving an assortment of hazy constellations overhead. I rested well through the night, getting up once to find that the clouds had returned and it was somewhat warmer. In the morning the sky was still overcast and sugary snow fell intermittently as we ate breakfast and packed. Our route for the day was somewhat circuitous, following the frozen waterways with short bushwhacks across the low hills between them. It was my turn to be on point and as we contoured around a hill not far from camp, my sled slipped off the ledge I'd intended it to follow, swinging around to the side and rolling over twice in the process. Fortunately I was able to get a firm grip on some vegetation and kept myself from following it down the hill. The PVC traces, however, were twisted around each other like two pieces of spaghetti. When Chris came over the rise behind me he said, "Hmmm, I didn't know PVC could do that." A little farther out we came upon some fresh moose sign: deep plunging tails through the woods, scattered hair and piles of droppings. In many places it seemed they had squeezed through impossibly small spaces between the trees. Following the Anjigami River we encountered some mushy areas and spots of open water. At one of these some Canadian jays had gathered--sizeable gray and white birds that seemed somewhat shy in comparison to their brazen blue counterparts in the south. We passed a number of beaver dams and crossed open swampy areas dotted with cedar snags. Lunch again was pleasant as the temperature let us be comfortable at rest. We ended the day on the shore of a little bay on the NW side of Mirimoki Lake. Our campsite afforded a view across the lake past some small islands cloaked in cedar to the hardwood forested hills beyond. We were tired from the trek and the evening started quietly as everyone rested and got set up. Later though we each visited the others in our small village. We chatted and relaxed the evening away, going to bed somewhat earlier than usual. Most off us were up before first light, beginning the morning's chores with headlamps. The sunrise was impressive--the sky streaked with dark bands of cloud and brilliant oranges and golds behind them. The sky had cleared by the time the sun was fully up and its warmth was strongly felt. Gail took the point and led us down Mirimoki Lake to its outlet and across the ensuing beaver ponds. When the waterways ended we climbed up a valley, cutting an azimuth toward Piquer Lake. Going up was easy, but coming down required belaying the sleds with ropes at one point for safety. The quote of the day appeared somewhere here: "Don't fall on your azimuth." (Had we been out there too long already?) At the bottom of the belay we found a seep had fashioned a lovely frozen waterfall and paused to get a few group pictures. When we reached Piquer Lake we stopped for lunch in a small cove. The sun was warm and we stretched out on our sleds after eating and basked in it. It was quite apparent that we would be reaching Old Woman Lodge a day ahead of schedule. We located the portage trail from Piquer Lake to Old Woman Lake and soon were crossing its wide expanse. As we moved down the Lake we foraged in the forests along its shores collecting large pieces of firewood to burn in the fireplace. The lodge was all Michael had promised it would be. Nestled in the woods on a small peninsula across from Burnt Island, it was constructed of logs with a metal roof. On the lower floor a large fireplace was the focal point of a big room with many windows and open all the way to the roof. Behind the fireplace was a smaller kitchen/pantry area. To one side of the fireplace a staircase led up to a loft room that overlooked the great room below. 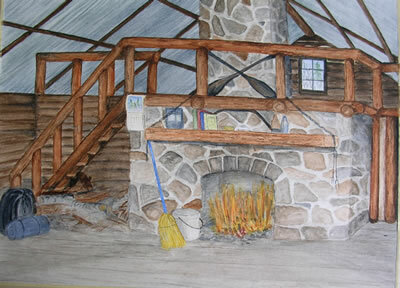 While the outdoors was visible in places between the logs, the building seemed structurally sound and had been kept fairly clean by the canoeists, fisherman and others who have used it. Reading the entries of other users in a log found on the mantle was part of the evening's entertainment. Michael had been there many years before and his entry was one of the first in the book. Dennis too had visited the lodge the previous March and left an entry describing his experiences. The evening went well. We jury rigged a pot support in the fireplace and melted a lot of snow in Chris's large pot. Loaded with long, 4'' logs, the stone fireplace warmed a small circle of chairs we placed in front of it. We ate and chatted, soaking up the radiant heat. 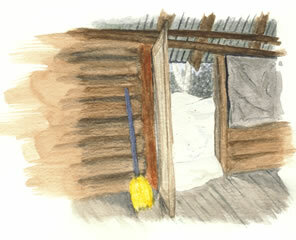 The cabin was clearly not designed for winter occupation though: a thermometer near the wall still read 26 degrees. After dinner we went out on the lake to look at the stars and to listen to the intermittent noises the lake was making. Probably it was the ice expanding, contracting, or settling as the temperature dropped. It made a hollow thundering sound similar to waves hitting a sea cave, but there was a burble to it too--very hard to describe. Later we spread our sleeping bags on the floor of the lodge and fell asleep to the crackling of the fire. I awoke at intervals during the night and listened to the chorus of soft snores that filled the room. Chris and I were awake when the first pink light of dawn came through the windows. We again built a fire and soon the others were stirring. The temperature had dropped to around 10 degrees during the night and the windows were lacy with frost. We packed our things, cleaned up the cabin and made some entries in the log. Then we spread our maps on the table to consider where we should wander since we were a day ahead of our original schedule. We chose as our objective a pair of small lakes almost due south of the lodge where the map showed a small waterfall. We followed a curving route to the east through a series of lakes to avoid a lot of climbing. The weather held and the traveling continued to be relatively easy. Cathy took her turn on point and Michael worked the slack (second) position, helping her read the terrain and pick a course. We reached our goal in plenty of time to get settled before dark. The falls between the two lakes turned out to be a beaver dam in conjunction with a slanting rock cascade kind of falls. It wasn't frozen and burbled pleasantly. We camped within sight of it at the south end of the lower pond. When darkness fell a waxing crescent moon smiled down. Hazy stars were out too. The cold that had been plaguing Michael from the start of the trip seemed a bit better, but Gail had been feeling less than optimal all day and now developed a cough. Last night in the bush: always a bittersweet thing. The friends who came to share my fire earlier have left to prepare for sleep and I've put on a couple of small logs for one more cup of tea. It snowed most of the day today and by afternoon the sledging had become a bit more strenuous. We covered quite a few klicks (kilometers), dropping south to Buzz Lake before turning north again through Corner Lake to Mash Lake Road which we will follow back to Hwy 17 in the morning. We did this roundabout route to avoid climbing but still had to break out the ropes to make it up one hill. In the early morning we heard a woodpecker working a tree along the shore of one of the ponds we crossed. Closer to lunch we found an active beaver lodge and listened at the breathing hole to see if we could hear the occupants. As I stepped up when it was my turn to listen, the crust of the snow broke. Sinking in over my knees I said, "I think I'm going to visit these beavers!" It was good to see Michael feeling better--getting into the land nav, chopping brush and smiling. He, Dave, Chris and Cathy even did a side trip to check out a tower that showed on the map off of Mash Road. Gail's been coping well with an ample supply of cold medicine and even did some of the point work in the afternoon. We ended up camping near the road by a couple of little wetlands connected by a small stream which I can hear gurgling under the snow in front of my tarp. As I write snow is falling again in heavy flakes and we may have quite a bit to deal with in the morning if it continues all night. The snow did continue intermittently through the night and by morning there was about eight inches of fresh white stuff on the ground. The loaded sleds sank deeply in it increasing the work of pulling considerably. The silence and beauty of the new snow made the morning's travel even more memorable though. The trail breaking team of Chris, Cathy and Dave had us back to the cars at Hwy 17 before noon.